Without the benefit of hindsight, we can imagine that John Weldon Wyckoff thought himself lucky. Fresh from college at Bucknell and with a year of seasoning in the Tri-State League, he was called up to the big leagues in 1913, to the powerhouse Philadelphia Athletics no less, for which he pitched on two pennant winners. Then, in 1916, he was traded, in midseason, to the Boston Red Sox, the successor to the Athletics as the dominant powerhouse in the American League. He might have been full of hope, especially after escaping the debacle that was the 1915 Athletics, one of the worst clubs in major league history, and on which he served as the most successful workhorse pitcher. But from there his career quickly fizzled. His role on the Red Sox world champion ballclubs of 1916 and 1918 was marginal at best, and he disappeared from the majors after making just one appearance early in the 1918 season. In hindsight, his career seems on one side doomed to frustration and on the other typical for a fringe ballplayer of his age, snatched up by a dominating team as a potential bit player. At the time Wyckoff was called up to the Athletics, manager Connie Mack was in the midst of sifting through young talent. Then there is the matter of his talent. A curveballer, according to the 1915 Reach guide, Wyckoff was difficult to hit during most of his major-league career. Only in the single-game 1918 campaign did he allow more hits than innings pitched in a single season. He led the Athletics in fewest hits per inning in both 1914 and 1915, and was among the top 10 in 1914 among pitchers with more than 500 batters faced. One newspaper account from 1915 spring training described him as faster than all but Walter Johnson and Dutch Leonard and with a better curveball than either. But he was wild. In those same two seasons, he also led the AL in wild pitches, with 14 each time. In his rookie season, his 6.7 walks per nine innings led all pitchers with more than 250 batters faced. In 1914, his 5.0 rate was the second worst (to Cleveland’s Rip Hagerman) for any pitcher with more than 130 innings pitched, when the league average was 3.1. In 1915, when the league average was 3.3, Wyckoff’s 5.4 was the worst for any pitcher with more than 200 innings, and was surpassed among pitchers with 500 batters faced only by his younger teammates Joe Bush and Rube Bressler. The disastrous 1916 campaign saw him allow almost a walk per inning in both Athletics and Red Sox uniforms, while striking out only four in more than 20 innings with the Athletics before he was sold. The increasing skepticism shown by the Red Sox management toward using the young pitcher was justified by his declining statistical performance. It is easy to conjure an image of the 6-foot, 1-inch,175-pount right-hander nibbling at the corners, racking up pitch counts astounding for the times, especially in that grueling 1915 season, in which he was third in the league in strikeouts (with 157), was eighth in innings pitched, but led the American League in walks (with 165) by a margin of 46 over the next most walk-prone pitcher. The signs that his career may have been ended by what in the day was termed a “tired arm” were clear in the precipitous decline in workload and performance he experienced after having spent nearly two full seasons as the “iron man” of an overworked pitching staff. Indeed, in later years he would complain to his family that his arm had been “worked to death” during the 1915 season. John Weldon Wyckoff was born in Williamsport, Pennsylvania, on February 19, 1892, the one of two sons born to Roland Nelson Wyckoff and Laura Beck. His brother was Hamilton Day Wyckoff. Roland, a taxi liveryman, had moved to Pennsylvania with his parents from New York. Lily’s father had come from England and her mother from Maryland, and it is clear that at the time of the marriage both families were well established in the town that would later become famous as the home of the Little League World Series. There are some conflicting reports about Weldon’s precise birthdate. Some baseball sources place it exactly one year earlier, and his obituary in the Wisconsin Historical Society Library places it as late as December 25, 1893. (One early baseball account places it on November 27 of that same year.) Though uncertain, his daughter MaryAnn Debbink favors the 1892 date and notes that the family tended to celebrate his birthday on Christmas Eve, but as a joke, never with the sense that it was the actual day, so that family tradition may have been the source of the obituary information. She also speculated that her father may have given different birth years in order to get around age barriers in the early stages of his career. Shortly after the census, John Weldon began to distinguish himself as a collegiate pitcher at nearby Bucknell University, which had also been the alma mater of Christy Mathewson. The records here are scant; he never became sufficiently famous that it is easy to find more than a dim outline of his activities outside the major leagues. Yet, it does seem as if he entered professional baseball without graduating. He signed contracts to play with Wilmington in the Tri-State League in 1912-1913, and may also have played with them in the 1911 season. But here, too, there are no firm records. In any case, Wyckoff was with the Athletics from the beginning of the 1913 season. The club received his contract in the mail on February 1, and he was effective in several spring training relief appearances, albeit against college and minor league clubs. On April 1, the young Bucknell recruit (the Washington Post called him a “student”) pitched masterfully against the crosstown National League rival Phillies in one of the last tuneups of spring training. The Boston Globe described him as the star of the game, for shutting out the Phillies on six hits and two walks, and allowing only one batter to reach third base. He also went 2-for-3 at the plate, with a triple and double. It is too bad that one of Wyckoff’s finest performances in a major-league uniform should occur in an exhibition game. As the season got underway, the Athletics eased him into things, but it was not pretty. On April 19, the Athletics’ bats knocked 1912 Red Sox star Buck O’Brien out of the game in the first inning. But neither Eddie Plank nor Wyckoff was able to get the team past the fifth inning. Wyckoff entered the game in the fourth and struck out one batter, but allowed a hit and two walks to start the fifth, leaving the bases loaded and none out for Pennock, who allowed only one run to score and pitched the rest of the game to maintain the victory for Philadelphia. After another disastrous start on June 4, Wyckoff found himself relegated to the bullpen, though he began to right his ship in that role, anchoring the Athletics’ 12th straight victory on June 6. Several more ineffective and even incendiary relief appearances followed. The team’s first-line starters were simply performing too consistently to allow the volatile youngster to take another turn in the rotation with the pennant on the line. With the Athletics and Giants leading their respective leagues, the two teams staged an exhibition between their “second string” rookie teams. Wyckoff and Ferdie Schupp handled all the pitching duties for their teams, in a game that ended in the 11th inning in a 1-1 tie. Wyckoff struck out six and allowed only two walks. The Athletics clinched the pennant by September 20, with a few games remaining on the schedule. Wyckoff finally made another start on September 24, but, the New York Times reported, he “was always in difficulty owing to his inability to get the ball over the plate, twelve passes being issued by him.” Although he allowed nine hits and nine runs, he benefited from two double plays and held on for the whole game. On September 29, Walter Johnson made swift work of the Athletics’ second-string lineup for his 36th victory, but missed in the report was that Wyckoff nearly matched him pitch for pitch, walking just one batter, allowing eight hits and allowing the game’s sole run in the seventh on a force-out grounder. On a frigid and windy October 3, the second-to-last day of the season, the Athletics played a doubleheader against the Yankees, with the first game a rocky World Series warmup for Plank and Bob Shawkey. The second game, called because of darkness in the sixth inning, featured Wyckoff and his typical wildness. He walked just two but tossed two wild pitches. He had completed his first year in the majors with seven starts and 10 relief appearances stretched over 61 2/3 innings, and with six other pitchers ahead of him in the Athletics’ stable. Although he did not pitch as much as in the following year, one could argue that 1914 was Wyckoff’s best in the majors. Connie Mack had not yet begun to disassemble the Athletics juggernaut that had won three championship flags in the previous three years, so the fact that Wyckoff started 20 games could be attributed to his potential to succeed, as well as to the typhoid fever that kept Jack Coombs out of action from early April 1913 until September 28, 1914. By the end of April, Wyckoff had entered the rotation on a regular basis. He began the season in the bullpen, continuing to show the wildness that plagued him the previous season. His first appearance, mopping up the losing end of a shutout, saw him walk two in just two-thirds of an inning. In his second appearance, though, he shut down the Red Sox on two hits over five innings after entering the game in the third inning, walking only two. Despite allowed the game-tying run in the eighth inning (in a Patriots Day game lost when Eddie Plank imploded in the ninth), it was enough to earn him a place in the rotation, especially after Bob Shawkey exhausted himself the next day by throwing all 13 innings of a 1-1 game called by darkness. On April 22, Wyckoff again bailed out an ineffective start by Byron Houck by entering the game in the fifth inning with the Athletics trailing 5-1. The Athletics roared back with eight unanswered runs, but in the bottom of the eighth, Wyckoff suddenly tired and surrendered four runs to tie the score. The game was called in order for the teams to catch a train, with the scored tied and Plank again on the mound. Houck, a strong contributor to the 1913 Athletics’ staff, soon jumped to the Federal League after giving up nine runs (five earned) in just 11 innings in Philadelphia. Although completely ineffective in his first start of the season (he “was wild, and when he located the plate his curves were not puzzling,” the New York Times reported), Wyckoff took full advantage in his next turn, on April 28, his second career matchup with Walter Johnson, outlasting Johnson, 2-1, on the strength of three errors by the Senators, including one on a fly ball by Wyckoff himself that brought in the winning run. His five strikeouts were one more than his opponent fanned and he showed remarkable control, walking but three, while scattering six hits. He regained in poise whatever he had not quite achieved in control, cruising to a 10-1 triumph over the powerful Red Sox in his next start, allowing six hits but, once again, seven walks. This he followed with a tight 5-4 victory against Detroit in which he walked no one. The win moved the Athletics from third place into a tie for first. He walked six on June 12, but again defeated his opponent handily. In his next start, on June 15, he again hurled a complete game, but walked eight. It was his last victory until late August. His next five starts saw him spiral downward. Against the Browns, he walked only one, but he also lasted only one inning, allowing five hits and five runs. In his next start, the Athletics lost to Walter Johnson by a tight 2-1 score, though Wyckoff managed to last only three innings before his wildness forced his removal. He took a 4-2 lead into the seventh on July 4 in a game hosting the Yankees, but tired quickly in that frame, allowed the Yanks to score four runs, and lost 7-5. In his next turn, July 9, he lasted but three innings and took the loss, then pitched in relief the next day, during an 8-8 tie called for darkness in the 11th inning, and once again was wild and ineffective. From then until late August, Wyckoff found himself banished to the bullpen. The Athletics clung to a slim, two-game lead, but were not ready to risk that margin on the fortunes of an increasingly unreliable pitcher. By the next time Wyckoff was entrusted with a starting appearance, the Athletics had opened an 11-game lead. This time, finally, the young hurler made a quality showing, walking just one in a complete-game victory against the Tigers. He also struck out six, arguably his finest performance of the season. His reward? Two straight bullpen appearances as the “first string” hurlers began to receive their post-season tune-up. On September 8, he bested Walter Johnson again, this time as his teammates exploded for a seven-run fourth. In his remaining appearances, all with the pennant question settled, Wyckoff returned his wild ways, walking eight in a 3-2 loss to the Tigers. He won his last start of the season, on October 1, a 3-1 mop-up affair over the Senators. He also pitched in the last game of the season, in relief, in a tune-up for the World Series. Wyckoff did make the World Series roster that year and pitched in the first game against the Braves, mopping up for a battered Chief Bender with 3 2/3 innings of effective ball, with a striking amount of control. Entering the game in the sixth inning after Butch Schmidt had singled home Possum Whitted with the third run of the frame against Bender, Wyckoff walked Hank Gowdy, but then induced a fielder’s choice and double play to get out of the jam. That first walk would be the only free pass he would issue that day, after being so profligate all season long. A leadoff single went for naught in the seventh, but, after getting Whitted to pop out to start the eighth, he allowed the next two batters to hit safely. The Braves, however, succeeded in plating but one run, and that on a steal of home by Schmidt, as Maranville struck out and Gowdy was caught stealing on the same play. The ninth inning was marked by three harmless groundouts. For the team, the game was a hopeless cause, a 7-1 Game One defeat in the process of being swept by the shocking Miracle Braves, a series that showed the serious chinks in the Athletics’ armor and sparked the massive selloff that left the team dismantled and flailing for a generation. For Wyckoff, it was a sign that he could pitch himself out of tough jams, but it was his only career appearance in the Fall Classic. The 1915 season did not begin auspiciously, and it was easy to see how it would amount to Wyckoff’s last full season in the big leagues, as well as his longest. He had always been wild, but the first several starts saw the problem compounded with interest. In his first start, a 9-1 loss to the Yankees on April 17, he surrendered five walks in just two innings, when he was lifted for a pinch hitter and a series of pitchers who fared just as badly. In his second start, he actually pitched long and well enough to get the win, despite surrendering eight walks. But, tiring in the eighth inning, he was lifted with two runners on and a 6-3 lead. The Red Sox came from behind in the ninth inning to hand the Athletics a loss. On April 28, Wyckoff rose to the occasion of another duel with Walter Johnson. This time, though, he was done in by a rocky first inning, in which a hit, a sacrifice fly, a walk and an error led to the game’s only run. The Athletics had a chance to score in the fifth but the Big Train this time got the best of them and handed Wyckoff his second loss of the season. Walks were once again the story, as Wyckoff surrendered six to just one by Johnson (though Wyckoff actually recorded one more strikeouts than his opponent, five). The main idea in the Yanks’ defeat was a slim, modest youngster by the name of J. Weldon Wyckoff, who has been out of college such a short time that he still remembers his Latin and Greek. J. Weldon can do other things besides read Sanskrit. He can pitch. He can do more than that; he can pitch so well that it’s next to impossible to hit him. The Yankees got three hits off Wyckoff. One of these slams was a three-bagger in the ninth by Doc Cook. Doc scored on a wild pitch. If J. Weldon had not taken it into his head to get wild at that moment, the Yankees would have been ignominiously kalsomined. In mid-June Wyckoff strung together three straight impressive wins in which the Athletics provided him with plenty of run support. But he was being worked very hard. In a stretch of 42 games from April 28 to June 19, he started 14 times, sometimes on only two days’ rest. He was pummeled in that June 19 game, and sat out the team’s five-game homestand against New York, watching from the side as high-school recruit Bruno Haas walked 16 in a humiliating nightcap to one of two doubleheaders in the series (Haas would issue two walks per inning in a career that lasted six games). Wyckoff rejoined the rotation on a road trip to Washington, but each start was worse than the one before: after losing 4-1 on June 26, he was shut out consecutively on June 29 and July 3, pummeled to the tune of 8-0 and 11-0. The rest of July was a rough month, with marginal respectability, but his team won only one of the seven games he started before July 31. The high point of this long, hard, hopeless season was doubtless Wyckoff’s 1-0 victory over the Cleveland Naps on July 31. The local press still thought vividly enough of his youth—he was still only 23, after all—to represent him as fresh out of college despite having weathered two tough previous campaigns with a much better team. Frustratingly, it was his only victory in a string of 14 starts stretching from June 11 to the end of the season, and it would prove the only shutout of Wyckoff’s brief career. David Jordan attributes the sale of the 1915 “staff leader” of the Athletics to the Red Sox in 1916 to the Connie Mack’s general housecleaning of established players. The statistics suggest different motivations. Wyckoff’s performance in 1915 had only intermittently been good and, from the distance of history, could perhaps be seen as signaling only marginal value as emergency insurance to a contending club. And the New York Times reported his June 27 transfer to the Boston club as a simple release. Wyckoff’s time in Philadelphia in 1916 had been a disaster, exemplified by a June 22 relief performance in which he hit a batter, gave up four walks, a hit, and a run in just two innings of a loss. But this had been typical. His first start of the season, on May 31, came in the second game of a doubleheader in New York, when he had already pitched to two batters in the first game (giving up a walk and a hit and held responsible when both scored). Although he pitched a complete game in this afternoon outing, it was an ugly, embarrassing affair. He walked“only” four, but struck out none, while allowing 10 hits and nine runs, five of which were earned, as the Yankees romped. Hugh High’s fourth-inning home run was only the fifth home run Wyckoff allowed in his career, and it was the last. But he didn’t get many more chances. A June 26 start was only his second of the season, on the road in Boston. The Athletics prevailed, 8-5, against an ineffective string of five pitchers. But Wyckoff lasted only three innings, and though he allowed no hits, he left with the score tied 2-2, having walked six batters. It was not his last appearance for Philly. The next night, he didn’t walk any batters, but gave up two runs in 1 2/3 innings. Then he was sold to the Red Sox. With a set rotation of Carl Mays, Babe Ruth, Ernie Shore, Rube Foster, and Dutch Leonard, there was no hope that Wyckoff would earn a start; indeed no other pitcher started that year for the Red Sox after his arrival. He was lucky to find eight relief opportunities, and he averaged a little less than three innings per appearance. Indeed, he did not get into a game for over a week after the transaction, despite a string of four doubleheaders in a week and a 17-inning draw. His first appearance was in the second game on July 15, relieving the Babe in the seventh inning of a 17-4 romp. Ruth allowed only three singles in his six innings, but Wyckoff managed to surrender two runs. The next day, Vean Gregg was shipped to the International League, seeming to indicate more room for Wyckoff to get into games. His next appearance was not for another two weeks, in the first game of a doubleheader against the Tigers on July 29. He came on in relief of an uncharacteristically ineffective Babe Ruth, who was hammered for three hits and three runs in one-third of an inning. But Wyckoff, while lasting longer into the game, was not much better, giving up eight hits and six runs in three innings, walking four. By the beginning of August, Gregg was back with the team and Wyckoff’s role again was reduced. Boston was at this point in a desperate struggle with the White Sox, who went on a tear, took advantage of a Red Sox stumble against the visiting Browns and opened up a 1½-game lead. With their starting reliables performing at superhuman capacity, they simply could not take a chance on an uncertain pitcher who had not performed well all season. Wyckoff did not get into another game until August 16, when he was used as a pinch runner in the 14th inning of a 5-4 defeat of the White Sox. By the time Wyckoff pitched again, it was August 26, and the Red Sox had opened up a five-game lead, this time over the Tigers. Once again, though, he failed. In relief of Mays, who had dueled Bill James for eight innings and allowed only one unearned run, Wyckoff gave up a ninth-inning triple to Ossie Vitt, who scored the game-winner on a Donie Bush sacrifice fly. Heading into the final month, the Red Sox fell into a slump, dropping 13 of 22 at one point and falling to third place. Wyckoff did pitch effectively for one inning in a loss on September 4. Wyckoff barely made the Red Sox out of spring training in 1917, and was held out of games until May 14, when he was brought in to bail out Dutch Leonard, who was pulled out of a game against Cleveland after three innings with the Red Sox trailing 4-0. Weldon lasted five innings in this affair, but allowed four hits and three runs (just one earned), hit a batter, and walked four. Although this ineffective performance left him sporting an impressive 1.80 ERA, his season in Boston was suddenly and literally cut short on May 16 when a piece of glass cut through his shoe and, according to the Globe, nearly severed his toe. He did, however, recover sufficiently to pitch a half-season with the sixth-place Buffalo Bisons of the International League. There, Wyckoff possessed the best ERA on the staff in his 20 games (2.96), but was the least effective member in won-lost terms, going 6-11, and posting stats that were fully consistent with his Philadelphia years: 139 hits in 140 innings, but yielding a walk slightly more than once every two innings (73 total), and striking out far fewer than he walked (53 total). Last evening “Ykee” made the assertion that he is full of the stuff. Command after command was shot at the Williamsport jitney man by the skipper at Majestic Park. He pitched in batting practice, shacked [sic] flies in the outfield, worked out in bunting practice and was near the head of the pack as they raced around the park. Once or twice it appeared as if there might be a short circuit or two, but never did “Ykee” threaten to burn out. A few times he looked appealingly toward the manager and admitted that he was tired when Ed inquired as to how he felt, but the best he could get out of the boss was a signal to keep hard at it. Manager Barrow is particularly interested in Weldon. There is a place for him on the pitching staff and the manager wants him to make good. Very few pitchers have any more stuff than Wyckoff. It is his control that is poor. . . .
Wyckoff seemed to live up to the high expectations of Martin’s article. He played very well in an exhibition match on April 1 in Little Rock against the Brooklyn Robins, and three days later, again vs. the Robins, this time in Austin, Texas, he not only pitched well but homered. On April 7, he played right field in Mobile and got the only hit of the game. It was if he had been retooling as a double-threat player, perhaps inspired by the Babe’s example. But the promise of spring training came to naught. 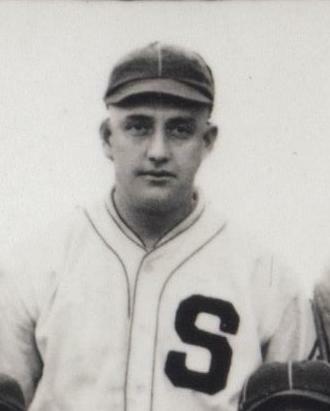 Although he appeared in an exhibition game after the start of the season against the Doherty Silk Sox, playing right field, batting leadoff, and hitting the first pitch of the game for a home run, his only appearance of the regular season during the Red Sox’ great 1918 run was on the short end of a 14-4 loss to Washington on May 8. The game was started by Joe Bush, who was ineffective. Wyckoff, in relief, did walk just one batter, and struck out two, but also allowed four hits and a run in just two innings in a mop-up role, a mediocre appearance but not the worst on his team that day. He went 0-for-1 at the plate. Wyckoff refused the demotion and returned, for the moment, home to Pennsylvania. This refusal had fatal consequences for his career. His name appears on a list of players who had appealed for “reinstatement” as late as 1922. On March 10 of that year, Commissioner Kenesaw Mountain Landis issued his decisions about 11 players who had been suspended for various reasons. Landis’s action restored Wyckoff to the active list for Boston. Apparently, the Red Sox ignored his request to be declared a free agent, and invoked the reserve clause to get him suspended when he refused the assignment. He certainly did not record any statistics for Minneapolis, though he was purchased on June 19 by Jersey City of the International League. He appeared in one game for the Skeeters, on June 23, and seems to have pitched effectively. His line was a complete-game loss in which he gave up just seven hits and two walks and struck out seven. That he never appeared in another game, despite such an auspicious beginning, could have been due to pressure from the major leagues, which a last-place club like Jersey City would have had no interest in fighting. While the report about the commissioner’s 1922 review gets some dates wrong (the 1918 refusal was backdated to 1917), the reason given for Wyckoff’s reinstatement—“because since 1916 he has engaged in no baseball activities”—shows a charitable willingness to ignore basic facts about a fringe player’s career. Since the rash of scandals in 1920 and after, Landis certainly had bigger fish to fry, and the reinstatement had no practical effect other than to clear Wyckoff’s good name. After his playing days, Wyckoff retired first to Williamsport, where he had maintained a residence throughout his playing career. There he continued to run the taxi (jitney) business inherited from his father and mentioned in Martin’s 1918 spring training article. Yet the 1920 census reports that John Weldon, still just 28, recorded his occupation as “baseball player.” He lived on West Fourth Street in Williamsport with his 29-year-old wife, Lena, and two children, John William Wyckoff, born in 1916, and Charles, born the year after. During the next few years, John Weldon’s life fell into some turmoil. He moved to Battle Creek, Michigan, where he performed warehouse and office work for the Postum (now Post) and Kellogg cereal companies and played on their company baseball teams. In 1924, he married Marie Therese Toomey of Shenandoah, Pennsylvania, implying, of course, that he and Lena were divorced. The staunchly Catholic Marie soon found herself cut off from her family, most likely because of objections to her marrying a divorced man. Marie and John Weldon moved to Sheboygan Falls, Wisconsin, in 1926 in order that he might join the Wisconsin outlaw baseball league. That year he was on the Sheboygan Chairmakers baseball team that won the league championship, and his play during that season earned “Wykie” (as he continued to go by his old nickname) induction into the Sheboygan County Baseball Hall of Fame. His son Joseph was also born in that year. Thenceforth, mention of Wyckoff’s baseball career fades from family memory. His two surviving children, MaryAnn (born1933, still living in Sheboygan Falls) and Jerome Francis (born1935, now of Eagle River, though his children also continue to live in Sheboygan Falls) both report that baseball had become a painful subject for their father by the time they were old enough to talk to him about it. He felt bitter and ill-used, both because of the abuse his arm took during the 1915 season and his later treatment by the Red Sox organization. He had put much of his baseball memorabilia in storage in Chicago, where it was lost, and at one point he won a contest sponsored by the Red Sox that brought him back to Boston. He used the opportunity to try to confirm some aspects of his baseball career, but an employee turned him away from the team offices on the grounds that all record of his service to the Red Sox had been destroyed in a fire. It is possible that he was investigating his contract and details of his demotion to the minors, the matters that had gotten him temporarily banned from professional baseball. It seems that Wyckoff’s marriage to Marie marked the birth of a brief fling as a baseball barnstormer, but it is also equally clear that it closed the door on the part of his life that included his major league career. Indeed, he was even more completely silent on the subject of his first family, awareness of which did not reach his daughter until 2005. Into the 1950s he worked as a bartender at the Franklin Hotel, operated in Sheboygan Falls by Julius Heus. After Heus died, Wyckoff signed on as a machinist with the Kohler-Joa Company and also worked as a bartender at Gartzke’s and Horn’s taverns. On May 8, 1961, he died of a heart attack, aged 69, while working in his yard. He had had a gall bladder attack a few years before that had left him in a weakened condition. In the end, Wyckoff enjoyed the career of a shooting star in three years with the Philadelphia Athletics and experienced the same highs and lows of his team during that time. When he was sold to the Red Sox during the next season, he was clearly damaged goods. However, he continued to impress management with his energy early in the next two seasons, before the rigors of the campaign would leave him depleted and unable to hold his own alongside the star players crowding the Red Sox dugout. He retired with a career record of 23-34 and a lifetime ERA of 3.55. But in 1915 he also sported the second highest single-season walk total of any American League pitcher of the Deadball Era. Interview with MaryAnn Debbink on October 17, 2007. Interview with Jerome Wyckoff on October 17, 2007. 1954. Jefferson NC and London: McFarland Press, 1999. Lieb, Frederick C. The Boston Red Sox. New York; G.P. Putnam’s Sons, 1947. Marshall D. Wright. The International League: Year-by-Year Statistics, 1884-1953. Bill James and Rob Neyer. The Neyer/James Guide to Pitchers. New York: Simon and Schuster, 2004. 433. The Washington Post, April 2, 1913. Boston Daily Globe. April 2, 1913. New York Times. May 31, 1914. New York Times. May 6, 1915. David M. Jordan. The Athletics of Philadelphia: Connie Mack’s White Elephants, 1901-1954. Jefferson NC and London: McFarland Press, 1999, 76. New York Times. June 28, 1916. Boston Daily Globe. May 18, 1917. Edward F. Martin. Boston Globe. March 20, 1918. Christian Science Monitor. March 10, 1922.